Felix As Good as it Looks Mixed Flavour Packs are a range of delicious flavours from the As Good as it Looks wet cat food range. They will ensure that your cat receives variety in her diet. 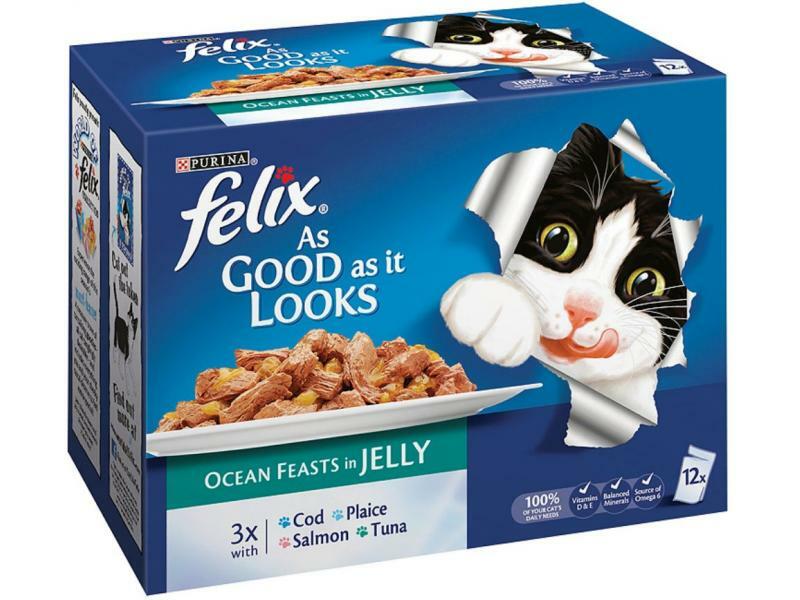 The come in delicious ocean varieties for cats that love fish, country recipes for a more homely, country touch and the classic favourites range which any cat will love. 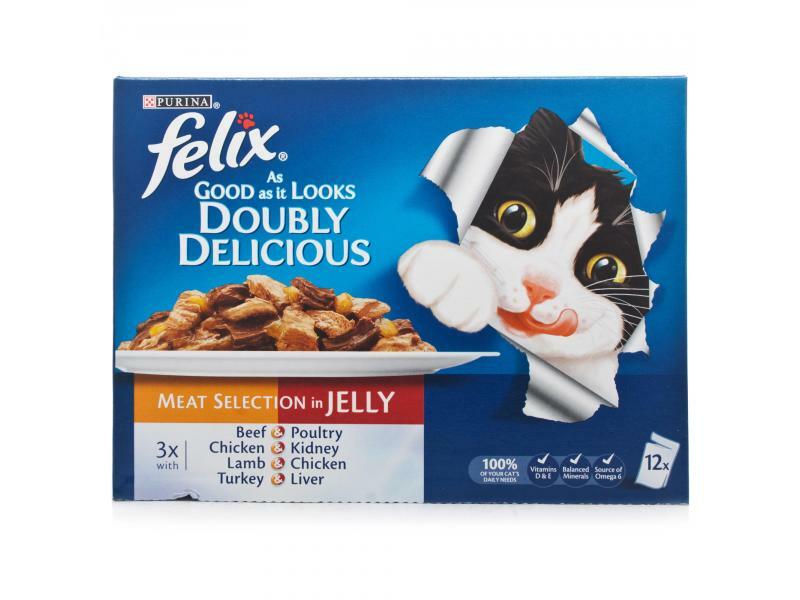 Mixed flavour packs will give your cat a different taste every day to help them to keep enjoying their food and to give a range of different nutrients. Meat and Animal Derivatives (of which Beef 4%), Vegetable Protein Extracts, Fish and Fish Derivatives, Vegetables (Carrots 4%), Minerals, Various Sugars. Meat and Animal Derivatives (of which Chicken 4%), Vegetable Protein Extracts, Fish and Fish Derivatives, Vegetables (Tomato 4%), Minerals, Coloured with EC Additives. Meat and Animal Derivatives, Vegetable Protein Extracts, Fish and Fish Derivatives (of which Salmon 4%), Vegetables (Courgette 4%), Minerals, Coloured with EC Additives. Meat and Animal Derivatives, Vegetable Protein Extracts, Fish and Fish Derivatives (of which Trout 4%), Vegetables (Green Beans 4%), Minerals, Coloured with EC Additives. Meat and Animal Derivatives, Vegetable Protein Extracts, Fish and Fish Derivatives (Saithe 4%, Salmon 4%), Minerals, Various Sugars. Meat and Animal Derivatives, Vegetable Protein Extracts, Fish and Fish Derivatives (Herring 4%, Trout 4%), Minerals, Various Sugars. Meat and Animal Derivatives, Vegetable Protein Extracts, Fish and Fish Derivatives (of which Salmon 4%, Sardine 4%), Minerals, Various Sugars. Meat and Animal Derivatives, Vegetable Protein Extracts, Fish and Fish Derivatives (Trout 4%, Mackerel 4%), Minerals, Various Sugars. Meat and Animal Derivatives (of which Beef 4%, Poultry 4%), Vegetable Protein Extracts, Fish and Fish Derivatives, Minerals, Various Sugars. Meat and Animal Derivatives (of which Lamb 4%, Chicken 4%), Vegetable Protein Extracts, Fish and Fish Derivatives, Minerals, Various Sugars. Meat and Animal Derivatives (of which Turkey 4%, Liver 4%), Vegetable Protein Extracts, Fish and Fish Derivatives, Minerals, Various Sugars. Meat and Animal Derivatives (of which Chicken 4%, Kidney 4%), Vegetable Protein Extracts, Fish and Fish Derivatives, Minerals, Various Sugars. Meat and Animal Derivatives (of which Chicken 4%), Vegetable Protein Extract, Fish and Fish Derivatives, Minerals, Various Sugars. Coloured with EC Additives. Meat and Animal Derivatives (of which Beef 4%), Vegetable Protein Extract, Fish and Fish Derivatives, Minerals, Various Sugars. Coloured with EC Additives. Meat and Animal Derivatives, Vegetable Protein Extract, Fish and Fish Derivatives (of which Tuna 4%), Minerals, Various Sugars. Coloured with EC Additives. Meat and Animal Derivatives, Vegetable Protein Extract, Fish and Fish Derivatives (of which Salmon 4%), Minerals, Various Sugars. Coloured with EC Additives. Meat and Animal Derivatives (of with Rabbit 4%), Vegetable Protein Extract, Fish and Fish Derivatives, Minerals, Various Sugars. Coloured with EC Additives. Meat and Animal Derivatives (of which Lamb 4%), Vegetable Protein Extract, Fish and Fish Derivatives, Minerals, Various Sugars. Coloured with EC Additives. Meat and Animal Derivatives, Vegetable Protein Extracts, Fish and Fish Derivatives (Cod 4%), Minerals, Various Sugars. Meat and Animal Derivatives, Vegetable Protein Extracts, Fish and Fish Derivatives (Plaice 4%), Minerals, Various Sugars. Meat and Animal Derivatives, Vegetable Protein Extract, Fish and Fish Derivatives (of which Sardine 4%), minerals, Coloured with EC additives. Meat and Animal Derivatives, Vegetable Protein Extract, Meat and Animal Derivatives (of which Tuna 4%), Minerals. Coloured with EC additives. Meat and Animal Derivatives, Vegetable Protein Extract, Meat and Animal Derivatives (of which Pollock 4%), Minerals. Coloured with EC additives. The following tables show the typical analysis for both the meat and fish varieties. 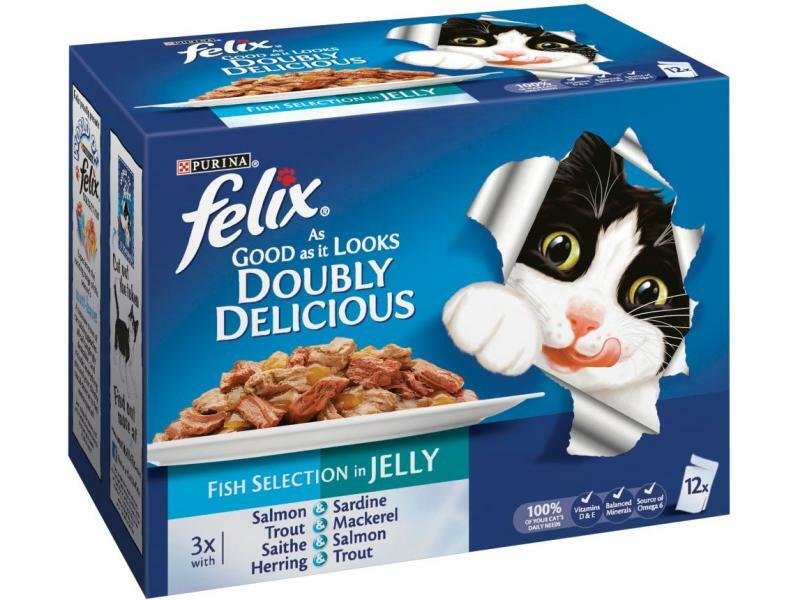 Felix cat food is a complete wet food for adult cats. An average 3.5kg adult cat should be fed approximately 3 pouches per day, preferably split into 2 separate meals. For pregnant or nursing cats, feed as much as your cat will eat. Food should be served at room temperature. There are currently no questions for Felix As Good As It Looks Mixed Flavour Cat Food - be the first to ask one!